If you're looking for an affordable entry level home in the Jupiter / Tequesta area, Lighthouse Cove should be high on your list of "must sees". Tucked away in a great location to the east of Dixie Highway with its' close proximity to beaches, restaurants and shopping make this a great community. Lighthouse Cove condos are a great alternative to high priced seasonal rentals which in addition carry a bed tax well over 10% of the cost of the rent. Invest in your future, and buy your dream vacation home. Residents are greeted by the fountain at the grande entry at Lighthouse Cove as you wind around towards the spectacular resort inspired clubhouse. The clubhouse features indoor racketball courts, volley ball, 24/7 gym access, onsite management, tennis, swimming pools, water features, tropical foliage and a tiki bar, meetups are fun and relaxed. Located just west of US Highway 1 in Tequesta, Lighthouse Cove is a short drive to beaches on Jupiter Island. North to Bridge Road you'll find public beach access and on the Alternate A1A bridge crossover there's intracoastal easements to fish or launch kayaks and jet skis. On-site management tends to the daily needs of full, part-time and leasing residents. Included in the monthly fees, the condo association includes building insurance, common grounds maintenance, use of clubhouse, amenities and a laundry list of other perks. 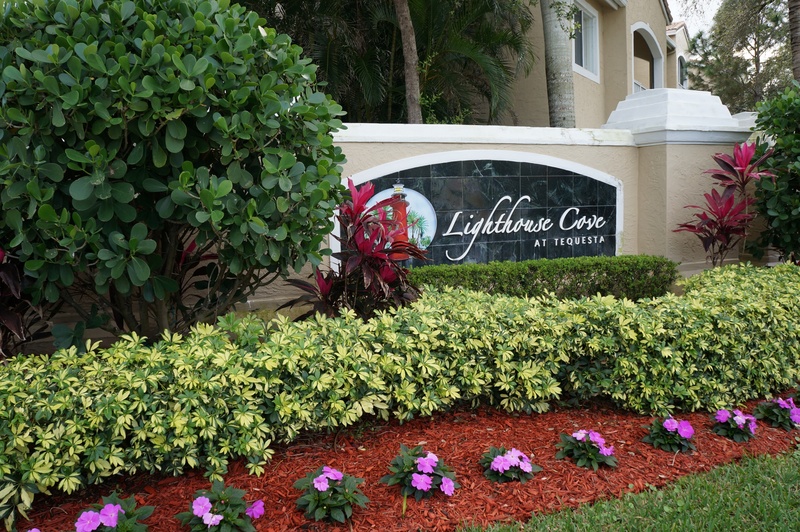 Living in Lighthouse Cove gives owners the freedom and security of leaving their home for extended periods of time. Lighthouse Cove is a resort style condo community with a relaxed atmosphere, great location and ample amenities. Ample lounge chairs line the pool deck with views of the waterfall features as an amazing backdrop. With layouts in 1, 2 and 3 bedroom configurations, there are a variety of homes to choose from. Detached garages are optional. 3rd floor units have vaulted ceilings and panoramic skyline views. There's an abundance of great dinners, shops and restaurants within walking distance of the Lighthouse Cove entrance. It's as easy as walking to the County Line Publix Shopping Center to the east. There's an Ace Hardware, Rancho Chico Mexican Restaurant, Wendy's fast food, Time To Dine, Dollar General Store, banks, salons and boutiques throughout the plaza. SEARCH ALL LIGHTHOUSE COVE CONDO LISTINGS HERE. Sign up for FREE Lighthouse Cove listing alerts, view detailed photos of the grounds, properties and amenities. If you've been thinking about making the move to South Florida, there's no better place to be. Lighthouse Cove checks off all the boxes of convenience, worry free living, resort style amenities and ease of coming and going as you please. FOR MORE INFORMATION ON HOMES FOR SALE IN THE JUPITER / TEQUEST AREA - CLICK HERE. Denise Copeland is a 30 year full time resident of the Jupiter / Tequesta area and provides a wealth of knowledge to her real estate clients. There is no client who is "too small" - all clients are deserve the same respect and attentiveness, as she believes that real estate is one of the largest investments in her client's lives and should be treated accordingly.